HTC has announced a pair of new handsets, going under the name of HTC Desire 10. 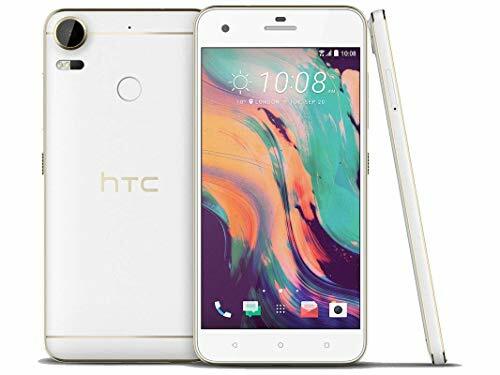 The name is designed to evoke memories of the HTC 10, the company's excellent 2016 flagship handset and the colourways are designed to stir your passions. Dropping the splatter design that adorned some of HTC's earlier Desire handsets, the Desire 10 is designed to be more elegant and classic. Picking up on a theme of art deco, the handset matches gold trim with classic colours for a high contrast finish. The gold of the trim, which HTC tells us takes 8 layers of coating, finished with laser cutting, means that the antennae bands blend into the design. It's a finish that shouldn't work, but it does. The HTC Desire 10 Pro is different. With so many handsets dropping into the mid-range with metal unibodies, it's nice to see something with a little character. HTC will be offering four different colours of the HTC Desire 10 Pro. The matte black is fairly conventional, offsetting that gold detailing for a classic deco finish. The most distinct colour is that which HTC is calling "valentine lux". It looks like the sort of colouring you get on some vintage porcelain, or those mints your Grandma always had. The white is fairly conventional and HTC told us that it's designed to be easy to clean and finally we have royal blue. This we really like as it evokes memories of that solid colouring that's used for things like school prospectuses and badges, or a university graduation day programme. The HTC Desire 10 Pro is a big handset, measuring 156.5 x 76 x 7.86mm and weighing 165g. With the design of the Desire 10 Pro and the Desire 10 Lifestyle, the lower-spec device launched in parallel, it's the hardware where the difference really lies. The HTC Desire 10 Pro features a 5.5-inch display with a 1920 x 1080 pixel resolution, for 400ppi. That size of display on a device this size sets it out as firmly in the mid-range. First impressions are reasonable, but on the pre-production samples we saw we couldn't judge what the final display performance will be like. The display is topped with Corning Gorilla Glass to keep scratches away. Sitting at the heart of the Desire 10 Pro is a MediaTek Helio P10 chipset. This is a 64-bit octa-core chipset and one that's used in a number of mid-range devices, because it's cheaper than a similar Qualcomm chipset, while still enabling slick performance. There will be 3/4GB RAM and 32/64GB storage (varying between regions), with support for microSD, although strangely HTC has opted to stick to the older Micro-USB connection, rather than USB Type-C that's becoming more established. There's a 3000mAh battery with support for fast charging, although at this stage we have no idea of what the endurance will be like. Equally, aside from some quick hands-on time with the new device, we've not had the chance to gauge its long-term performance. The readout of the specs matches the Desire 10 Pro's positioning, although don't be fooled by the Pro moniker. Unlike the iPad Pro, for example, this isn't flagship and then some, the name is really just a counterpoint to the Lifestyle framing of the other Desire 10 handset. One of the nice additions is the fingerprint scanner. Moving from the front (as found on the HTC 10 and HTC One A9), the Desire 10 Pro puts the scanner on the back for quick unlocking, as well as providing a shutter button for the camera, so you can tap to snap. One thing that the Desire 10 Pro doesn't get is BoomSound. HTC's signature sound system is omitted on this handset, whereas the Lifestyle version gives you Hi-Res Audio support with a 24-bit DAC and twin speakers for stereo sound. Instead you have the BoomSound headphone profile to give your headphones a lift, but in terms of audio, the Desire 10 Pro takes a backseat to the Desire 10 Lifestyle. If you're looking for the best of everything, the Pro doesn't quite deliver it in the audio department. Where HTC really wants you to pay attention is in the camera department. The HTC Desire 10 Pro has a 20-megapixel rear camera with f/2.2 lens. If that sounds familiar, it might be because the specs of this camera look the same as those for the HTC One M9, 2015's flagship, except that it doesn't offer 4K video capture. HTC is saying that this is the best camera in a Desire handset yet, but we haven't had the chance to test that. Megapixels alone don't make a great camera, but the inclusion of laser autofocusing at this level is a point of difference and should mean that the camera is fast to lock on and bring you sharp shots. Boosting the control of the camera, you'll get full manual controls as well as RAW shooting, if that's what you're after. Through the advanced pro mode you'll be able to select the type of photo you want to take too, like macro, as well as tweak individual settings like IOS, exposure length or focus. The front camera doesn't want to be left out of the action, with a 13-megapixel sensor. This also offers a range of features, like live makeup and the ability to take ultra wide selfies so you can fit all your friends in. Launching with Android Marshmallow with HTC Sense, the HTC Desire 10 Pro offers the same sort of software features as you'll find on the HTC 10, with freestyle themes and a range of launch gestures. That means a fairly uncluttered version of Android, free from a lot of the bloat that you'll find on mid-range devices from other quarters. Although we've not tested the handset to a great degree, we'd expect the day-to-day performance to be good. Importantly, the Desire 10 Pro is a handset that looks different and distinctive and we like that. We're still awaiting pricing, which will be crucial, and the availability, which HTC is saying will be determined later in November.